Listen to "Meat Eater: Adventures from the Life of an American Hunter" on your iOS and Android device. 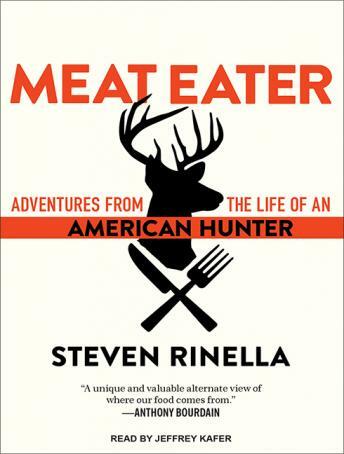 Meat Eater chronicles Rinella's lifelong relationship with nature and hunting through the lens of ten hunts, beginning when he was an aspiring mountain man at age ten and ending as a thirty-seven-year-old Brooklyn father who hunts in the remotest corners of North America. He tells of having a struggling career as a fur trapper just as fur prices were falling; of a dalliance with catch-and-release steelhead fishing; of canoeing in the Missouri Breaks in search of mule deer just as the Missouri River was freezing up one November; and of hunting the elusive Dall sheep in the glaciated mountains of Alaska. A thrilling storyteller with boundless interesting facts and historical information about the land, the natural world, and the history of hunting, Rinella also includes after each chapter a section of 'Tasting Notes' that draws from his thirty-plus years of eating and cooking wild game, both at home and over a campfire. In Meat Eater he paints a loving portrait of a way of life that is part of who we are as humans and as Americans. Awesome. Great perspective, written really well, love the small facts throughout the book. Get it listen to it. The get his other book on American buffalo. Also a great read. I loved listening to this book. I watch his show and the book was just as good if not better.